My Problem Areas: Oily skin. Breakouts. Skin irritation. What I was looking for: I'd noticed that the cleanser that I was using, appeared to be irritating my skin, so I wanted something gentle, and preferably designed for Sensitive skin, whilst my recent experiences have led me towards oil-free products, in order to control my oily skin, which I am pretty certain is one of the main causes of my breakouts. Why I chose the Simple Range: Simple promote themselves on being the experts in sensitive skin, and I know so many people that swear by the products. I have used their Eye Make Up Remover before, and I've had the chance to try some of their other facial wipes (when my mum has bought them). I've never experienced any personal issues with anything, and although I had never tried any of their Oil Balancing products before, I was fairly confident that Simple would be a good buy. I wanted to try the Oil Balancing Range, because they contain Zinc, and I had read that zinc is good for the skin. How they work: After you have taken off your make-up, preferably using a gentle eye make up remover, pull a wipe out of the packet (make sure that you seal the packet shut as soon as you've taken a wipe out, otherwise you might forget and find that all your wipes have dried out!). Carefully, rub your face with the wipe, concentrating on any areas that are specifically prone to breakouts or are just generally oily. Did they sort out my problem areas? Whilst it is still too soon to say whether or not they have combatted the breakouts, I did notice that the wipes seemed somewhat "different" to typical facial wipes, I don't know if it was the lack of oil, but the texture just felt different against my skin when I was using them. I'm over the moon to be able to say that my skin did not feel oily at all after I had used this wipes, and I'm even happier to say that they didn't dry my skin out either, like so many other products that claim to combat oily skin do. Any Downsides? The price. 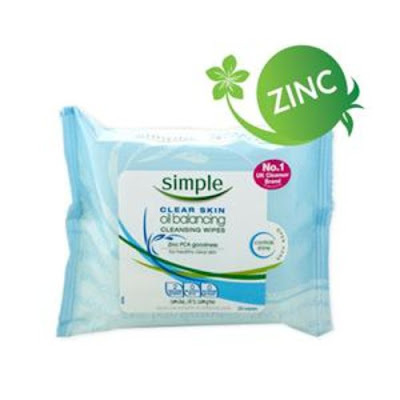 At roughly £2.39 for one packet of 25 wipes, or 2 for £4 at Morrisons, I will admit that I find these wipes to be quite expensive, and certainly one of the most expensive brands of facial wipes on the market. If used everyday, these won't even last a month, and if you are using them twice a day, as many professionals recommend then they'll only last two and a half weeks. I don't know about anyone else,but I don't really want to be paying over £2 every two or three weeks, on facial wipes. Especially not when I can buy a Gentle Cleanser in a Bottle for roughly the same price, that could potentially last two, three or more times longer than the wipes.